Managing and monitoring mobile operatives and ensuring their work is planned efficiently is always challenging especially for organisations that do not have the budget to invest in complex mobile operative tracking and work scheduling solutions. Our Uniclass Repairs and Maintenance (for Social Housing, Highways and Waste Management organisations) combined with our mobile workforce software, our management dashboard and Bing Maps from Microsoft enables operations managers and workforce planners to monitor where mobile workers currently are and where they should go next. Reducing travel time and therefore costs to complete a job are essential requirements for any organisation running a contract management operation. 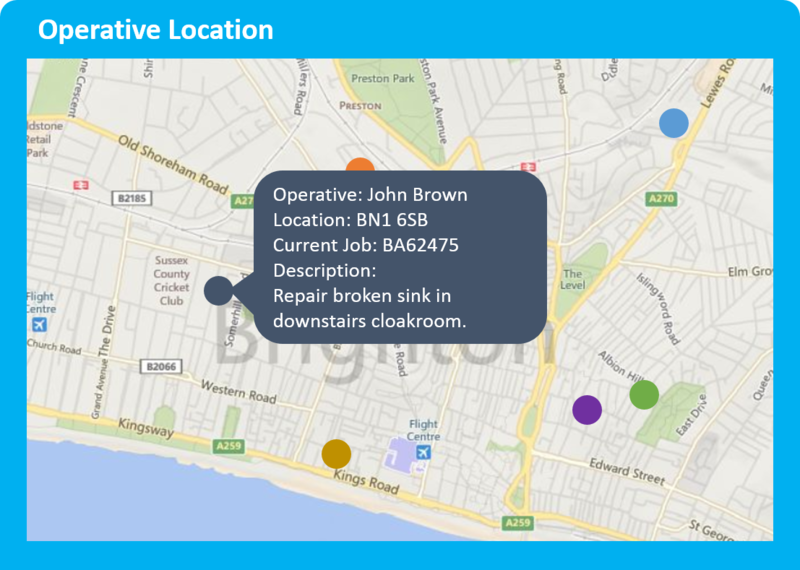 Our software enables operations managers to see where their operatives currently are, what job they are working on and how long it is likely to take. Planners benefit from seeing this information when planning a mobile workers emerging day. They can see where workers are and where the next jobs are and make decisions regarding which operative is most suitable for each job based on trade and skill and current location. This ability to visualise the day’s work and the workers available to carry out that work empowers planners with all the information they need to ensure appointments are kept, jobs are completed on time and travel costs are reduced.